Sony Pictures has decided to play a game of calendar shuffle, but it shouldn't affect your moviegoing plans too drastically. They are rearranging some of their biggest tentpoles to better suit their needs. Which means their 2017 release slate looks a little bit different than it did yesterday. Included in this switch-up are the highly anticipated sequel Bad Boys 3, the Stephen King adaptation The Dark Tower and the live-action Barbie movie. It was just announced last week that The Dark Tower will be shooting in South Africa this April. The movie stars Idris Elba as Roland "The Gunslinger" Deschain, Matthew McConaughey as the evil Man in black and Abbey Lee. It was originally set to debut on January 13, 2017. It will now open the week following Valentine's Day, on February 17. It will be going up against the epic Chinese co-production The Great Wall starring Matt Damon and the franchise finale The Maze Runner: The Death Cure. Opening the previous week are some big movies, which will definitely hold over through this second week at the box office, with the sequel Fifty Shades Darker set to rule Valentine's Day weekend. Also opening in this frame is John Wick: Chapter 2 and The LEGO Batman Movie. Bad Boys 3 was originally supposed to open on February 17. With The Dark Tower taking over its slot, this long-anticipated action comedy starring Martin Lawrence and Will Smith is now being positioned as a summer tentpole. It will arrive June 2, 2017, opening against the comedy The House starring comedy heavyweights Will Ferrell and Amy Poehler. Bad Boys 3 is being directed by Joe Carnahan, best known for The A-Team and The Grey. 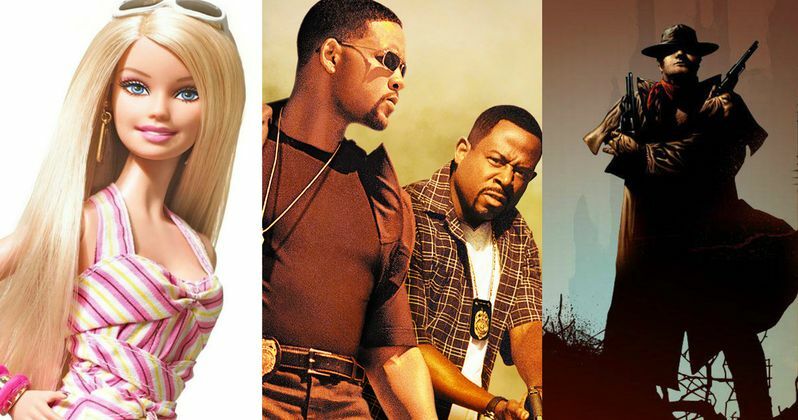 Bad Boys 3 is taking over Barbie's slot on the 2017 release calendar. This live-action comedy based on the iconic Mattel doll will now kick off summer, arriving a few weeks early on May 12, 2017. It currently has that weekend to itself, but the blockbuster sequel Guardians of the Galaxy opens the week before, on May 5th. And the following week will see the arrival of the Baywatch movie starring Dwayne Johnson and Zac Efron. Barbie doesn't have a director or any cast members lined-up just yet. The screenplay is coming from acclaimed writer Diablo Cody, the woman responsible for such cult favorites as Jennifer's Body and Young Adult. Jenny Bicks is also contributing to the screenplay. While Barbie has been given an earlier release date, it's possible that the movie could be shuffled off the slate completely. We've heard no updates on the movie in quite some time. But it's obvious that Sony has big plans for both The Dark Tower, which has sequels and a TV series already planned, and Bad Boys, with Bad Boys 4 coming summer 2019. So, which, if any, of these movies are you most excited about?